I don’t know how they did it, but a commenter on the previous comic somehow managed to correctly identify the victim as the Doctor. And then, of course, Locke had to completely give it away with a not so subtle response. C’mon Locke, it’s like you’re on THEIR side! 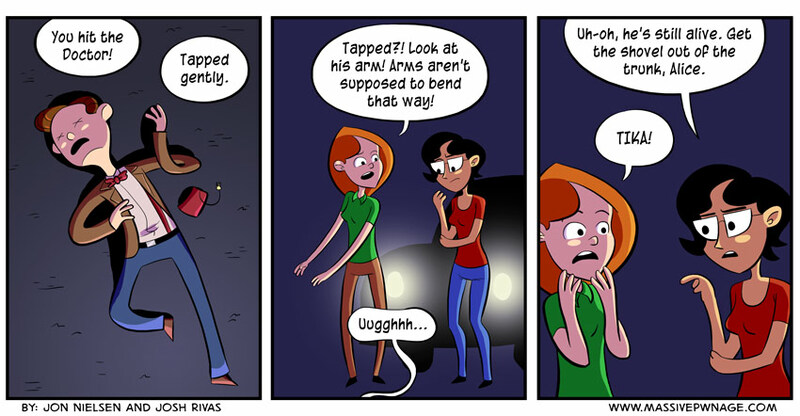 This entry was posted on Monday, October 29th, 2012 at 12:00 am and is filed under Comics. You can follow any responses to this entry through the RSS 2.0 feed. Both comments and pings are currently closed. Tika’s either concerned for her legal status, or a Tennant fan. Both of which are completely reasonable and agreeable things. I have no idea how that guy managed to guess correctly. Of course Locke is on our side, we gave him a lifetime supply of chocolate chip, buttermilk cookies for his loyalty to us. YOU SAID YOU’D NEVER-…I suppose all the cards are on the table then.